O/o Deputy Director, Town and Country Planning, Dhemaji. 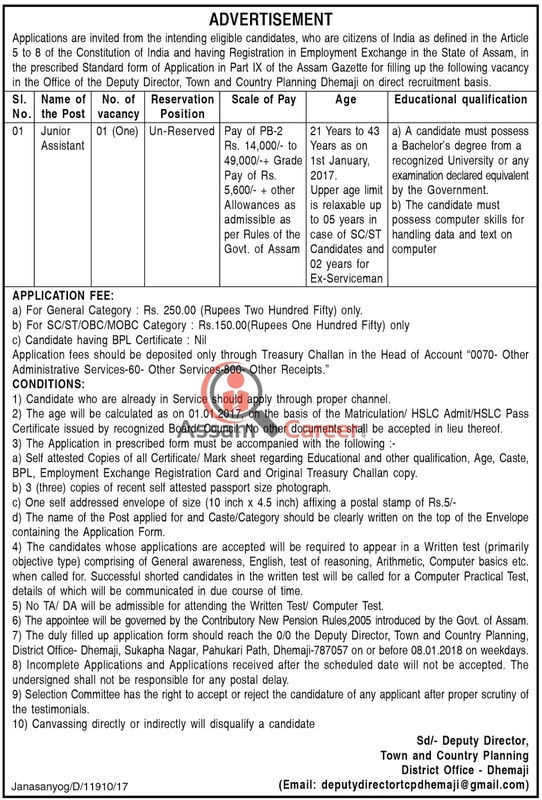 Applications are invited from the intending eligible candidates, who are citizens of India as defined in the Article 5 to 8 of the Constitution of India and having Registration in Employment Exchange in the State of Assam, in the prescribed Standard form of Application in Part IX of the Assam Gazette for filling up the following vacancy in the Office of the Deputy Director, Town and Country Planning Dhemaji on direct recruitment basis. a) Graduate from any recognized university. b) The Computer Skills for handling data and text on computer. a) For General Category : Rs. 250.00 (Rupees Two Hundred Fifty) only. Selection Process: The candidates whose applications are accepted will be required to appear in a Written test (primarily objective type) comprising of General awareness, English, test of reasoning, Arithmetic, Computer basics etc. when called for. Successful shorted candidates in the written test will be called for a Computer Practical Test, details of which will be communicated in due course of time. No TA/ DA will be admissible for attending the Written Test/ Computer Test. How to apply: The duly filled up application form should reach the O/o the Deputy Director, Town and Country Planning, District Office- Dhemaji, Sukapha Nagar, Pahukari Path, Dhemaji-787057 on or before 08.01.2018 on weekdays. a) Self attested Copies of all Certificate/ Mark sheet regarding Educational and other qualification, Age, Caste, BPL, Employment Exchange Registration Card and Original Treasury Challan copy. b) 3 (three) copies of recent self attested passport size photograph. d) The name of the Post applied for and Caste/Category should be clearly written on the top of the Envelope containing the Application Form.